HOUSTON, March 22, 2018 /PRNewswire/ -- The Houston Refinery of LyondellBasell, one largest plastics, chemicals and refining companies in the world, today celebrated its 100th anniversary. "I want to thank our refinery team for their dedication and commitment. I'm so proud of the important work they do every day," said Bob Patel, Chief Executive Officer of LyondellBasell. "The products made at our Refinery go far and wide and allow goods to move, people to travel and economies to grow." "Generations of Refinery employees helped produce the fuels that drove America's growth and supported the local economy over our century-long history," said Jerome Mauvigney, Site Manager of LyondellBasell's Houston Refinery. "I am inspired by all who came before us and the future workforce that will come after us." "LyondellBasell's Houston Refinery is one of the longest operating refineries in the Greater Houston area and is a testament to the rich history of oil and gas that built our economy," said Pasadena Mayor, Jeff Wagner. "The site's impact over the last century is truly immeasurable. We appreciate strong corporate neighbors like the Refinery and look forward to many years of great work together." 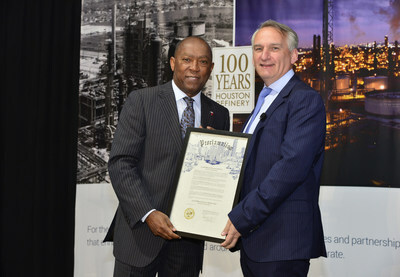 Harris County, Harris County Commissioner Jack Morman's Office and the City of Houston helped commemorate the site's centennial anniversary with a proclamation declaring March 22nd "LyondellBasell Houston Refinery Day." Additionally, the Refinery will join the Houston Astros Foundation Literacy Bus Program to celebrate its 100th anniversary. Through the program, employee volunteers will help distribute books to 100 classrooms in the Houston, Galena Park and Pasadena independent school districts. The Refinery generates approximately $671 million in annual economic activity for the local community and is home to 1,600 workers. In 2017, the site contributed more than $200,000 and 4,000 volunteer hours to support local initiatives driving improvements in health, safety, education and the environment. The Refinery was one of the first petroleum refineries constructed on the Houston Ship Channel. It traces its origin to the Sinclair Refining Company's 1918 purchase of 710 acres of land, which includes the point where General Sam Houston and the Texas Army crossed Buffalo Bayou as they marched to victory at the Battle of San Jacinto. Covering approximately 710 acres along the city limits of Houston and Pasadena, Texas, the refinery is one of the largest in the U.S., with a capacity of 268,000 bpd of heavy crude oil. The Refinery transforms very heavy high-sulfur crude oil into clean fuels, including reformulated gasoline and ultra-low-sulfur diesel. Other products include heating oil, jet fuel, petrochemical feedstocks, aromatics, lubricants and petroleum coke. For more information about the Refinery and its centennial anniversary, click here.